WHEN NATURAL ENGLAND IS INVOLVED? Never underestimate the fatal combination of a local authority hungry for funding and Natural England determined to impose grazing irrespective of the views of those who live on and love the common. 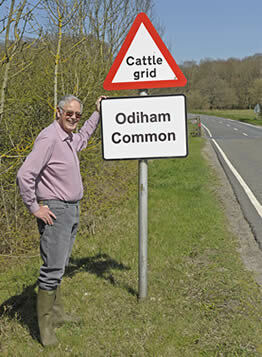 Previous visitors to this website will know the story of Odiham Common. After designating the common as a SSSI in 1992 English Nature pressed the local authority to produce a management plan. The management plan followed the standard issue of g razing and fencing and, as the 300 acres are extensively wooded, extensive tree felling. The plan was drawn up in 1995 and was strongly opposed by the local residents who wanted to retain the existing woodland character. However the local authority, backed by English Nature refused to heed the concerns of the local residents. Instead they decided to try to railroad through their ill-conceived plan. The first public inquiry gave them permission to fence, graze and fell for an experimental five year period. At the second public inquiry five years later the local authority and Natural England (and their consultants) could not show any conservation benefits resulting from the five year experiment. The local residents won a resounding victory. The application to continue and extend the fencing was rejected by the Secretary of State. The fencing had to be taken down. The next attempt was to set up a working group to produce a plan. From the very first meeting English Nature pushed for a grazing plan. The outcome was predictable. The local residents rejected the draft plan and the working party broke down in disarray. In 2009 came the latest ploy. Consultants were engaged to produce a plan under the Common Purpose process. The local residents were told the key skills required of the consultants were consultation skills and that Natural England would accept the outcome. After numerous meetings of the advisory committee comprising one local resident and full of ‘conservationists’ drafts of the key attributes that were valued on the common and a vision for the future were written. Management options were then prepared for consultation. The key issues were grazing and tree felling to create the open space demanded by Natural England. 85% of the respondents in the consultation who expressed a view on grazing, expressed the view that grazing on the southern meadow was ‘completely unacceptable and should not be considered further on any part of the common’. 87% of those who expressed a view expressed the same view about grazing in the woodland. So: a completely clear cut outcome. Grazing and all that went with it decisively rejected in the consultation. Without further ado the local authority, Hart District Council, adopted a management plan that incorporates grazing on the southern meadow and has grazing as an aspiration in the woodland. You might reel in surprise and shock and ask why. We can only assume there were meetings in ‘smoke filled rooms’ or ‘understandings’ about the minimum requirements from Natural England that Hart were prepared to sign up to. Hey presto: mission for Hart and Natural England was accomplished when within days £120,000 of funding was forthcoming. A Common Purpose does not provide a satisfactory process. Beware of the process and recognise it is another way for Natural England to impose its will. Understand the land owner – frequently your local authority – is not there to support or consider its constituents. It is motivated by funding and this is likely to lead to a fatal alliance with Natural England. At a time of austerity in public expenditure it is a nonsense to give £120,000 for a plan that is not supported by the local residents who do not want tainted money. I have just been reading the saga of Odiham Common. This decision is totally against the Coalition gov agenda of localism and the Big society. Natural England is another quango of course just like the Forestry Commission except that it has been severely cut if not had the chop.